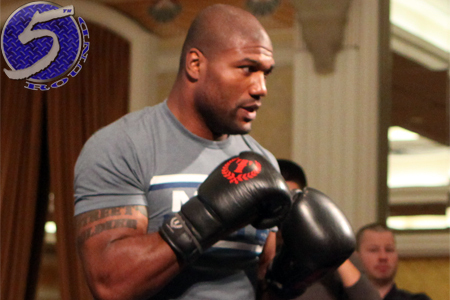 Although Quinton “Rampage” Jackson’s (Pictured) rematch with Mauricio “Shogun” Rua was never assigned a specific date, it appears the light heavyweight shootout will be delayed, nonetheless. “2 keep it real,the Shogun fight will have 2 wait, I just found out that I have 2 get surgery on both knees, but I heal fast don’t trip,” Rampage tweeted Thursday morning. Rampage posting a lopsided unanimous decision loss to Ryan Bader at UFC 144. After last month’s disappointing outing, the 33-year-old revealed he had suffered a knee injury during training and was prescribed Testosterone Replacement Therapy to help speed up the recovery process. The former champion subsequently tipped the scales a whopping five pounds over the limit for a non-title light heavyweight affair. Rampage blamed the weight he gained while on TRT that caused him to miss his mark. Over the last several days, Rampage has been petitioning for the UFC to release him despite having one bout remaining on his contract. The veteran feels disrespected because he’s fought injured on numerous occasions with no appreciation from his bosses. The organization has agreed to not retain his services after his sequel with Shogun. The Brazilian soccer kicked his way to a vicious TKO victory over Rampage at “Pride: Total Elimination 2005″ in Japan. No word on what Rampage’s timetable for recovery is, but now that he’s discovered the magical Fountain of TRT, he’s not expecting to be riding the pine for too long.